Not to be confused with Fort Bowie. Army Engineer Company training at Camp Bowie. 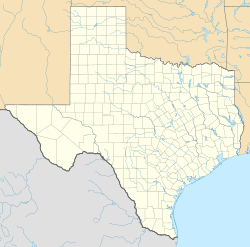 Camp Bowie, named in honor of the Texas patriot James Bowie, was a military training facility during World War II, and was the third camp in Texas to be so named. From 1940 to 1946 it grew to be one of the largest training centers in Texas. In 1940, the war situation in Europe caused the United States Congress to determine that it was time to strengthen the defense system. President Franklin D. Roosevelt was handed the power to mobilize the National Guard units. The 36th Division of the Texas National Guard unit arrived at Camp Bowie, located then in Fort Worth, in mid-December for their year's training, but before training was finished, war had been declared. On September 19, 1940, the War Department announced that a camp would be built at Brownwood. Work began at the campsite on September 27, 1940. The Camp was the first major defense project in the state and there was no scarcity of labor when the building work began. In 1943, the first German prisoners of war arrived; many were members of Erwin Rommel's Afrika Corps. The 2,700 men worked as day-laborers for the farms in central Texas. On August 1, 1946 the War Department notified Texas members of Congress that the Camp had been declared "surplus". The Civilian War Assets Administration was to take charge and began the distribution of the land and buildings. Camp Bowie suffered a large grass fire in July 2008, where several hundred acres of dry grassy areas of the facility were burned. Camp Bowie remains an active military training station and recently completed construction of new facilities including a firing range and several ammunition storage bunkers. ^ Krammer, Arnold (1979). Nazi Prisoners of War in America. New York: Stein and Day. pp. 43–44, 207, 260. ISBN 0812825713. "Camp Bowie". TSHA Handbook of Texas Online. Texas State Historical Association. "Camp Bowie". Texas Beyond History. University of Texas at Austin.